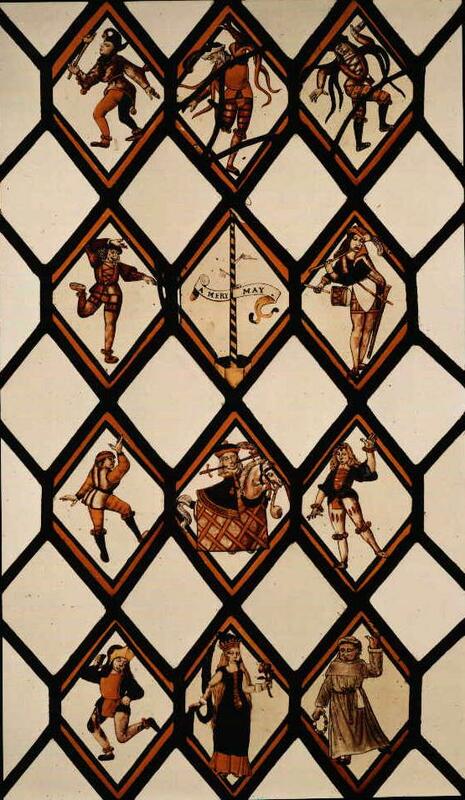 The Betley Window contains 12 diamond-shaped painted panes depicting medieval Morris dance figures. The question of its age is controversial. Its existence was not widely known until 1788, but it is believed to date from the 16th or 17th century, possibly made earlier than 1535. Michael Archer dates it as c. 1621 and refers to it as the best known window of its type (see Michael Archer, An introduction to English stained glass, H.M.S.O., London 1985, p.28). A photograph of the original Betley Window, now in the Victoria & Albert Museum, London, is reproduced here by kind permission of the Board of Trustees of the V & A.
Godfrey Brown has commissioned a replica, which may be seen in the Gallery at Betley Court. This replica is displayed to good effect, as it has been installed as an actual functional window. The installation of the replica window in 1981 (very appropriately, in the month of May) was marked by the issue of a special commemorative postage stamp - see the first day cover.